Madria Sophia Ruth Jones has been ordained as a high priestess of Déa in the Koré Di-Jana Ekklesia (aka Janites). She is most worthy and faithful. Praise be to Déa. Abaldi/Thurs. Day of Madria Thame’ (Themis). O, Madria Thame’, Jana of Justice, Order and Harmony, be with us. (The Seven Rays of Divine Manifestation.) In Deanic language, the Seven are of the Three-Fold Heaven (3 upward: (Madrias Candre, Raya and Rhave) and of the Four-Fold Earth (4 downward: Madrias Sushuri, Thame’, Vikhe and Mati). When ArchMatrona Ghrian and I first formulated the idea that Dea is One and Three and Seven, this formula expressed both the thealogy of the One Dea in Her Tri-une Form of Mother, Daughter and Great Mother and also of the One Dea in Her Septad Form of the Seven Janati. In our religion, we are often presented with the analogy of the prism. Just as white light flows through the prism and separates into seven colored rays, so too, the Pure Light of Dea is diffracted into Seven Intelligent Living Streams (each Stream expressing itself through a certain color.) These Seven Rays of Intelligent Light take on the form of angels. Just as the Holy Daughter takes on the Form of Soul, and yet, She remains Dea Filia (the Divine Daughter God); so the Janati take on the form of angels, but yet, They remain Dea. Janite Thealogy is based, in part, upon the Divine Sophia, Who is known as both Mother and Daughter in Her Tri-une Form as Mother, Daughter and Holy Soul. Sophia is pan-cultural. She is not limited to Judaic-Christianity. Many worship Her from all religious walks of life. As Rudolph Steiner and others have noted, Sophia is the Mother of the Seven Powers. These Seven Powers were sometimes considered to be angels although Gnosticism refers to them as Archons (which we consider a patriarchal demotion of the Sophian Myth as at the time, Gnostics did not see manifest creation in a positive light). Although archon means ruler, in Gnosticism, Archons were not the good guys. Sophia is also known as the Goddess of Heaven and the Mother of the Stars. Even in Gnosticism, She is known as the Mother of All the Living and the Highest Ruler over the visible Universe. She is said to have shaped manifest creation based upon the heavenly prototypes and She forms the seven star circles or spheres over which the planetary powers are placed. These planetary spheres, or heavens, were, for the ancients, the highest regions of the created universe. Considered by Steiner to be the new Isis, and, indeed, She was often equated with Isis in the past, Sophia is the Pneumatic Essence from which all souls draw their origin. In Her lower or Daughter form, She is the Mediatrix between the upper and lower realms. It is She, Who is the one Who is crowned with the Seven Stars. More and more, within and without Christianity, Sophia is swiftly returning to Her original Divine status. (1 +2) Many mainstream Christians, are beginning to recognize Her as the Holy Spirit from Whom emit the Seven Gifts/the Seven Spirits. Proverbs mentions Her Seven Pillars. As we see from the above, in many ways, it is from Sophia that comes the Seven. (Eurynome is on the far left). In the Myth of Eurynome, She created the Seven Planetary Powers, putting a Titaness and a Titan over each. From the Primordial Feminine standpoint, Theia ruled the Sun and was given the power of illumination; Phoebe ruled the Moon and was given the power of enchantment; Dione ruled Mars and was given the power of growth; Metis was given the planet Mercury and the power of wisdom; Themis was given the planet Jupiter and the power of law; Tethys was given the planet Venus and the power of love; and Rhea was set over the planet Saturn and given the power of peace. In Janite thealogy, the Janati are not the actual Powers, themselves. Rather, the Janati rule over the Planetary Spheres and They were given the Powers. These Powers represent the Seven Streams of life which contain the Primordial Essence or, perhaps we could say, the quantum information which is the base of all that is manifested into reality. We believe that like the Holy Daughter, the Janati are Immanent, meaning, though They stem from the Pleroma, They work within and throughout manifest creation. And while Dea, on one level, is Supreme and Above the All and yet She is One with us and She hears our cries, so too, the Janati, being angelic Forms of Dea, though they represent Powers beyond our ken, can hear us and help us. We are often asked, what is the difference between a Jana and an angel? Angels were created by God. They are not God. And so, we may pray to them in the form of asking their help and assistance. But, we may not honor them as God. We may not worship them. The Janati are UnCreated because They are God, They are Forms of Dea and so we may pray to Them. We may honor Them as God. We may worship Them. Especially when we consider Sophia. She is Their Mother… She gave Them birth… They are of Her. They are One with Her. They are Her Seven Spirits. Her Seven Stars. 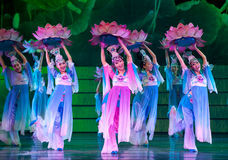 Recently, I found the beautiful video of the sacred Lotus Dance: http://www.mother-god.com/spiritual-inspiration-video-clips.html. This inspired me to look up more videos of the Lotus Dance. I found so many dazzling displays of this ancient dance that I couldn’t just choose one and so I will supply the search links below. In the East, Quan Yin is the Lotus of the East. Just so, the Celestial Mother Mari is the Water Lily of the West. How wonderful it would be to develop such awe-inspiring dances in Her honor! Posted on August 3, 2017 August 3, 2017 Author Kore Di-Jana TraditionCategories CustomsTags Deanic, Filianic, Mother God, Mother Goddess religion, Sacred Dance. We all feel it. We all know what it’s like to belong to a religion that is virtually unknown and unrecognized. It’s a lonely place to be, that is for sure. Lonely and not so lonely, because we have each other; we have the Janati surrounding us, always, and we have Dea, Our Divine Mother. We are never alone. Some people poke fun at ‘online religious communities’. Our religion began on-the-ground, in England, in the 1970’s. Ours is but one latter expression of it. Many religions began as a small, relatively unknown band or group of people who shared certain beliefs. Perhaps they started out being called by G-d Who spoke to their prophet through a fiery bush or maybe the Son of the Father incarnated to dwell amongst them. Other religions may have begun with an charismatic prophet who attained enlightenment under a Bodhi tree or from sacred texts older than historical time. One way or another, through the preaching of prophets, the performance of miracles, sacred writings or through just plain word of mouth, these religions all grew over the years, the decades, the centuries. Some were controlled and promulgated by governments, others were not. They were all fostered and subsequently flourished on the ground, in the material world not by ‘ instant mass media’ in cyber space. The Deanic Faith began with a group of highly educated Oxford women who came to understand that we have a Divine Mother God. These scholars were quick to point out that She is not a goddess, a superhuman, semi-divine or angelic being but She is God, Herself. Supreme Being. Supreme Being is the same way that same way that Jews and Christians understand the Father to be God and so we understand Dea to be God in the same way that Jews and Christians understand the Father to be God. Supreme Being. These women further intuited that Dea is God in Her Own Right. She is complete within Herself. And they discovered that the religion of the Divine Mother is the oldest religion in the world. The only religion still in existence who never forgot their Mother; who never allowed their Living Stream to dry up, is Hinduism, especially in the Shakti denomination. Other religions demoted Her. It is hard to over-estimate the brilliance of this thinking which took place an half a century before our own day when the Holy Spirit, the Divine Sophia and the Shekinah are coming to be recognized as part of the Godhead in Their Own Right. These women came up with a perfect system of worship for Her, for Dea Madria, Our Mother God. It was to be a very Feminine system of worship, the sum of which exists in perfect harmony with its parts. And, the gift of the scriptures, though perhaps interpreted in slightly different ways, has proven to be foundational to the over-all inner strength and spirit of the Faith. They gave us the Five Sacred Symbols, the Five Mysteries, the perfect Five Seasons,the Feminine 28 day calendar, the understanding of the Janati and so much more. And though these things may be little understood by those not of our Faith, they are our greatest treasures. They are our way of understanding, honoring and worshiping the Divine Feminine in this realm. They are our mindset and our heartset. The women from Oxford shared similar beliefs. They spread the Faith through magazines and printed publications. They formed small communities. Today, we of the greater Deanic religion share similar beliefs. In today’s world, the internet is the fastest way to ‘spread the word’, so to speak and it also connects believers from diverse parts of the world who would otherwise never come to know of each other. This relatively obscure religion is growing, growing all the time. I see it with my own eyes. I believe it has a future because so many want to worship the Divine Mother, but they don’t know how. Even those mainstream denominations who are coming to believe in Holy Sophia or the Feminine Holy Spirit or Holy Sophia, these churches might have some Divine Feminine hymns; they might have some Sophian prayers, but they don’t have an outright worship of Dea. They have yet to understand Her as being God in Her Own Right. We do. We are so fortunate. I know it’s hard when we don’t know how to respond to people when they ask us about our religion/spirituality. It’s hard because we are unable to respond with something that is immediately identifiable like Christian, Jewish, Hindu, Buddhist or Pagan. We can’t even say that we are of a ‘goddess religion’ because, as previously explained, there is a difference between goddess and God. I believe that one day, the term Deanic will be identifiable, but right now, it is not. After we are asked about our religious affiliation, the thought that goes through our heads is, ok, they’ve never heard of Deanism so how on Earth am I going to put this in a nutshell? I can’t just say I worship Mother God, because mainstream people will either have no idea what I’m talking about, or they will immediately think I’m an heretic or that I’m making it all up. Or, they will assume that I am Wiccan or Pagan, which I am neither. Next thought: Ok, there would be too much to explain in too little time and so I’m just going to say that I’m (and then name the nearest spirituality to Deanism). This is a tough situation for us and sometimes can make us feel a bit alienated from the world because our religion is so unique. We cannot identify as being a part of any of the Abrahamic Faiths, although we model Dea on Sophia/Shekinah. We cannot identify as being Buddhist or Hindu (although we might be considered a type of Western Shaktism). We cannot identify as being Wiccan, Heathen or Pagan. Pagans and Heathens are polytheistic, we are monotheastic. Pagans believe in gods that are superhuman. We believe in God that is Supreme Being. As an aside, this is why Janites are very careful to only use Living Stream ‘goddesses’ as Forms for Dea rather than Pagan goddesses. A Pagan goddess is not Supreme Being and therefore is not a suitable Form for Dea just as Zeus is not a Form of the Father God of Jews and Christians. They are not the same! Our religion is unique, brilliantly conceived, complex, beautiful and relatively unknown. If we are asked about our Faith, we, as Her devotees, Her priestesses, Her daughters, should be honest. This is hard, even for me because I don’t want to have to give a quick answer, leaving the querent with the wrong impression of our Faith. I want the person to have a correct understanding of our Faith. But, that is over-whelming because no-one’s ever heard of us and there’s too much to tell!!!!! I’ve been thinking about this a lot, lately. Only a couple of people at my work know that I am a priest (ess) of the Divine Mother. But, as a priestess, I need to be ready to answer for my beliefs, for my calling. Finally, we should never feel alone. It’s wonderful that we have the internet. It is the fastest way to spread information. It is a modern vehicle of long-distance community. I always have a sense of our sisters and brothers in the Faith. I feel like we are always spiritually together. I think of all of us when I serve the liturgy, pray or write an article. I think of all of us when I am walking down the road or driving to work. We might not live near each other. We might not have on-the-ground communities because we worship in our hestias, but I feel that our spiritual bond and our instant and sometimes daily communications, teachings, posts, our sharing and our caring, though it takes place through the cyber realm, is just as real as if we attended church service together. Let us remember the words of our liturgy, “Madria Dea, we have come before Your Earthly altar within Ekklesia, in union with the Great Janati Who stand before Your Celestial Altar in Heaven. May we be one in Spirit with all Your children, everywhere who are gathered together in Your Name. We are always one in Spirit and one in Ekklesia. We are always bound together in Dea. Always together in Spirit, out of time, out of space, which is more real than the material illusion around us. This is why Orthodox Christianity and Roman Catholicism teaches that the church, or more specifically, the liturgy is heaven on Earth or the meeting place between Heaven and Earth. This is due to the Power of what takes place during the liturgy. This is why, in most Orthodox and Traditional Catholic churches/chapels, people still dress in their Sunday best for liturgy. This same Power which brings Heaven down to Earth during the liturgy, is the same Power which binds us together as a community in Her Love, Her Spirit and beneath the enfolding shelter of Her Mantle. And we all share in the Daughter’s Soul. We have so much for which to be grateful with this beautiful Faith. And though it can be hard for us when the mainstream people all around us, even those who aren’t so ‘main-stream’, do not know of our religion let alone understand it; we still have to be those beacons filled with light. We need to pray to Madria Vicka for the courage we need and we need to ask Madria Sofia to guide us in all Wisdom. We may keep our answers simple and we must use discernment in what we say to whom, but we must not be afraid though our religion is little known by the mainstream. Someday, our religion will be known. Guiding Light of the faithful soul, fill the deepest caverns of our spirit with the exhilaration of Your love. Send us forth upon the world as torchbearers of Your delight and grant us strength in You and in ourselves that we may value all things, rightly, regardless of the consuming weight of the profane and the frailty of all that is beautiful. *Our thanks to Madrina Rosalie for her assistance in the proper pronunciation. The Great Liturgy of Dea, Janite Edition. Silver Light of the Forests from the Great Liturgy of Dea, Janite Edition. Tonight and tomorrow are the Full Blessing Moon. Sometimes, when the exact full moon occurs overnight, it can be celebrated either day and the three days thereafter. The Rite of Sacrifice may be offered. A nice option would be to offer a poetry reading to Dea or in Her honor during the Rite. (There is a time set aside for this or meditation right after the wine is consumed.) Other offerings might be flowers, a special incense, hymns, chants, Full Moon poems and prayers (do an internet search), etc. Pursuant to Sorella Shoshana’s article on the religious significance of historical head-wear is this stunning headpiece that she designed and hand-sewed. Sorella Shoshana is a very talented seamstress and educator of historical fashion. She has since designed a dress to go with the hat. We look forward to seeing the end result! I have always been drawn to the Buddhist practice of the seven offering bowls. Seven small brass bowls are placed upon the altar before a statue of Quan Yin, Tara, etc. Daily offerings are placed in each, each having a symbolic meaning. Some simply pour water in each bowl representing the seven offerings. The Traditional offerings are: Flowers (I used to float a single flower in one of the brass bowls with water), water for drinking, water for bathing, incense, perfume (can be a pure essential oil in a carrier oil), a candle (or oil light, tea candles work well in these bowls), food (usually in the form of rice), and a spiral shell, or tiny bells or cymbals. If you research the seven offering bowls of Buddhism, you will see different variations as to the symbolism behind the offerings, depending upon which school of Buddhism you are researching. I think this would be a lovely tradition to develop within Deanism. Madria Erin, of the Auroran Tradition, is developing and designing a Deanic Tarot!!!!! We are all soooo excited about this! May Dea continue to inspire you, Madria! We can’t wait to purchase our own decks!!! The Snake is not a person (he or it or she). The snake is a concept. The concept is “distraction: from Dea and Her Divine Will. It is the “space” between that which Dea has Created and that which she allows to happen (i.e. the consequence of free thought and free will). Embracing the snake (embracing those things which “distract” her from looking to Dea for guidance) does not give the snake (“distraction”) a life of it/his/her own. It is only a weight which drags the soul of the first maid away from Dea. This weight, takes on the shape of she who embraces it. But this weight (distraction) does not then become a person like the first maid (nor does it enter into a relationship with her). “When people, in their wild imaginings, think they are wandering away from the Light of Her Goodness, into the darkness of wickedness (personified in the Creation Mythos by the symbolic character of Irkalla), they are really fooling only themselves. All paths lead back to Dea Matrona. And one cannot be lost in the dark, for She is always there. She allows Her children to travel every path. She wants us to know, by experience, that no mater whether it is the right road or the wrong road, no matter whether we took a road because we were just curious, or made a mistake, or because we were lead astray into wickedness, She is still with us, still loves us, and will lead us back Home. While there are wild evil forces with power over lying spirits, and they roam hither and yon seeking prey, She Who is Goodness and Truth is stronger, and every ready and able to free you from evil and lies and restore Thame in various corners of the World, and in your life in particular. The rule of the tyrant is only permitted to last for a season. Dea’s Sunlight always melts the ice. The portion of the Madrian Creation Story describing the descent of the Maid/Daughter of Heaven into Hell (the Nether Realm of Irkalla, the Queen of Evil), is metaphysically symbolic of the Journey of the Divine Hero. [Note: Because the story was written for, and from the perspective of, an All Girl World, all the main characters, and minor characters, are feminine. Other versions of the same story are told elsewhere, where that particular world is structured differently, and major, and minor, characters are of different genders. However, in all the oldest stories, Deity is still Feminine]. The only parts of the Story that we need to concern ourselves with are the following: 1) The Mistress of All things destroyed the Gates of Hell, 2) She repelled the servants of Irkalla, the gatekeepers, and they ran away, 3) She found Her Daughter, restored Her to Life, and They embraced, and 4) “After this the Daughter stood alone. And the souls of the Nether World were awakened by Her gentle light, and followed Her through the shattered gates of Hell”.